Visitors to Montgomery County, Pa., spent more than $1.5 billion in 2016. That number grew by 3.2% from 2015 and should be even higher for 2017. In 2016, a total of $3.7 billion was spent by tourists in Philadelphia's suburbs; 41% of that was spent in Montgomery County. 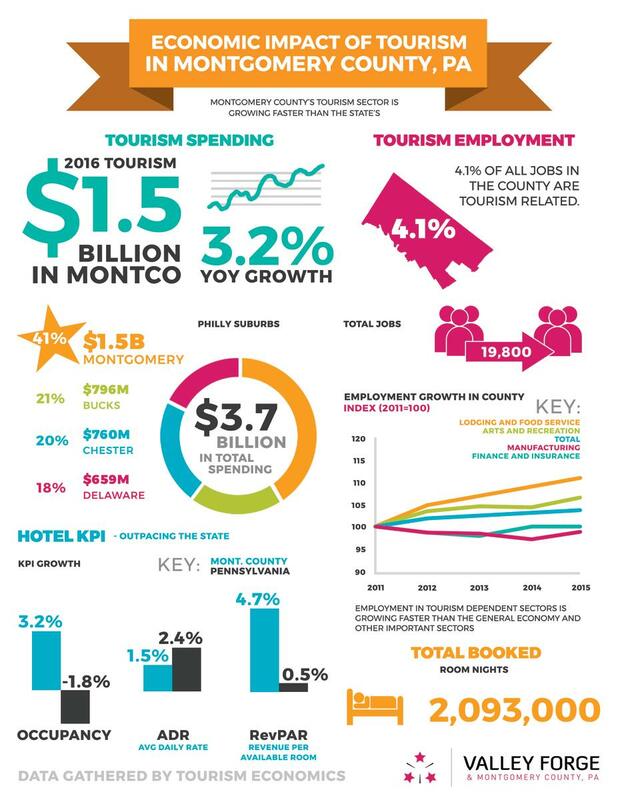 The tourism industry in Montgomery County, Pa., supports 19,800 jobs annually. In 2017, that number is expected to exceed 20,000 for the first time. Of those jobs, lodging and food service saw the highest growth year-over-year, followed by arts and recreation. More than 2 million hotel rooms were filled in Montgomery County in 2016. Every one of those guests helped contribute to our local ecomony - through taxes, through food purchases, through their hotel room cost and through spending at local businesses. High Level: The tourism industry benefits the entire local economy. The Valley Forge Tourism & Convention Board is working to grow all of these key indicators, and by supporting the VFTCB, you are supporting economic growth. Low Level: The Valley Forge Tourism & Convention Board is a go-to resource for travelers coming to Montgomery County. Whether they order a Visitors Guide or Crave Montco Dining Guide, visited ValleyForge.org or discovered one of our publications during their stay, we can connect your business to these visitors.